The Mediterranean diet reflects the traditional lifestyle and dietary patterns of people in parts of Greece and southern Italy, near the Mediterranean Sea. Years of research have shown that people in the Mediterranean region live longer and healthier lives. And recent studies have linked the Mediterranean diet to numerous health benefits including weight management and decreased risk of diabetes, heart disease, cancer and death. Stop eating processed and fast foods, and start using fresh ingredients to help you live a healthier, longer life. Our quick and easy meals are designed by doctors, dietitians and chefs to taste great and follow the most up-to-date research and health recommendations. Leave the work to us! The Mediterranean diet is much more about the foods you DO eat, rather than just cutting calories. Eating healthy can be fun! Our meal plans allow for outside meals and fewer restrictions. Eat foods you love, and live your life! The Mediterranean Diet has been proven to help people maintain a healthy weight, live healthier, and longer! Simply put: Anyone. The Mediterranean diet has been shown to have health benefits for people of all ages. help increase your life expectancy and lower your risk of heart attack, stroke, dementia and certain forms of cancers. Each week, we do all the meal planning for 3 lunches, 3 dinners and snacks. Our authentic meals not only include Mediterranean recipes, but dishes from countries and cultures around the world. Just choose your plan, follow our fun and easy recipes and enjoy delicious, healthy meals without hassle. 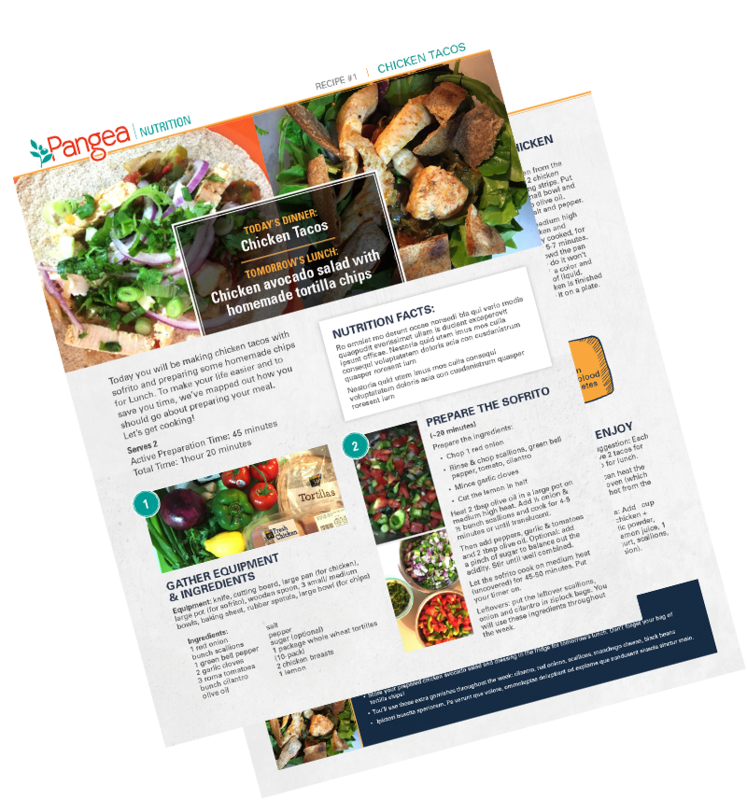 Let Pangea Nutrition bring the Mediterranean diet to you! Your plan includes lunches, dinners, plus snacks each week, for less than you’re spending now on takeout and delivery. Sign Up Now. $10 per healthy meal. We minimize waste and send everything you need. Cook most meals in about 30 minutes. Schedule convenient home delivery of fresh groceries (Skip a week or cancel any time). Cook dinner in about 30 minutes. Spend 5 minutes to make lunch for the next day. That’s it! Cook two or three times per week and enjoy science-based, healthy meals. No upcoming meals. Check back soon. designed by doctors. backed by science. The Pangea Nutrition Science Team of Advisors is led by Christos Mantzoros, MD, DSc, PhD h.c. mult. Dr. Mantzoros, a professor of medicine at Harvard Medical School, is a world renowned leader in the fields of nutrition, obesity, diabetes and metabolism with over 800 publications. With decades of combined research and clinical practice, our team at Pangea Nutrition is constantly looking for ways to help people improve their health and wellness.